Garlock LEAK-GARD 3750 Aramid fibers with a proprietary rubber binder. A compressed non-asbestos gasket sheet of aramid fibers and a proprietary rubber binder that reacts with oil to create a tight seal. 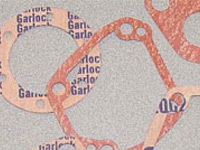 Garlock LEAK-GARD Gasketing provides a tight seal in oil applications. Proprietary compound reacts with oil to create a tight, long-lasting seal without gasket degradation. LEAK-GARD gasketing is am improvement over traditional gaskets as it provides no loss of compressive load over time, no degradation of gasket in oil service, and no weepage as with vegetable fiber or cork gaskets. Garlock LEAK-GARD Gasketing actually increases bolt load and blot retention and compensates for low-load areas. LEAK-GARD Gasketing stops leakage in transformers, turbines, gearboxes, generators, and fuel pumps.